As highlighted in our previous paper, “Understanding the inflection point for Online Retail”, indexing from the year when online share crossed 0.5% of total retail, we’ve noticed that typically within the first 2-3 years, each market goes through a sudden upsurge – “a tipping point”, in the otherwise more gradual growth, of online retail. 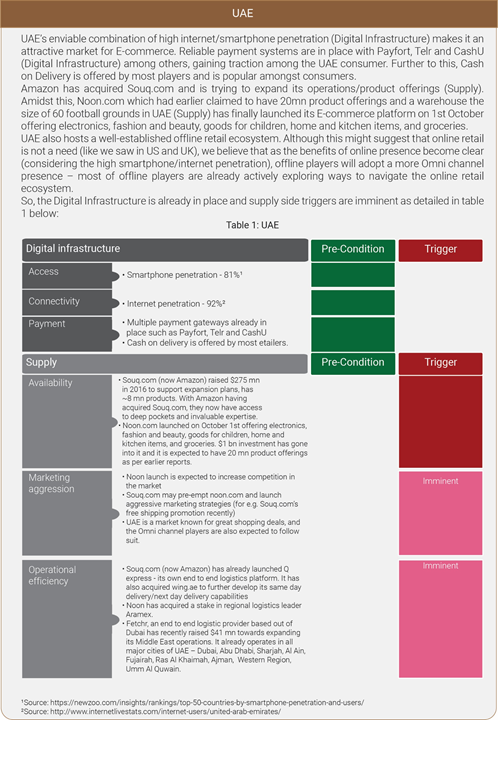 While our study pointed out that triggers are the key factors that contributed to the tipping points, we also highlighted preconditions (Digital infrastructure/Supply related requirements), that served as the platform for the triggers. These spikes in growth can also be broadly bucketed into two macro waves coinciding with the Internet/PC penetration increase in the late 1990s/early 2000s, and the smartphone penetration increase in early 2010s, ably supported by other supply related factors. For detailed understanding of these dimensions across the 4 countries, please take a look at our previous paper. 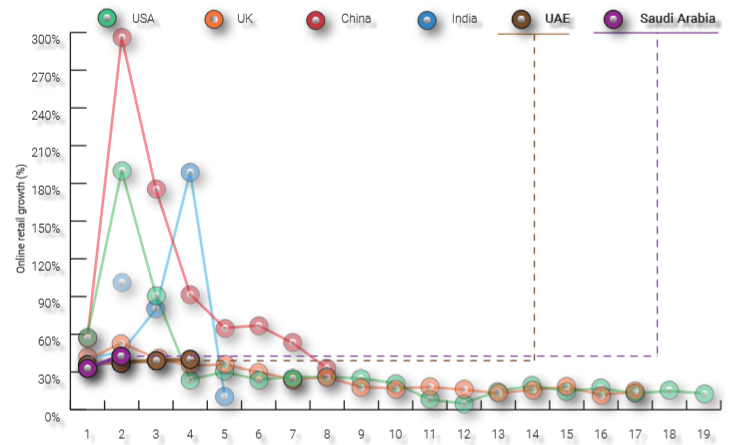 Now, we apply the learnings from our previous analysis on the 4 countries, to understand where UAE and Saudi Arabia stand in the online penetration journey. 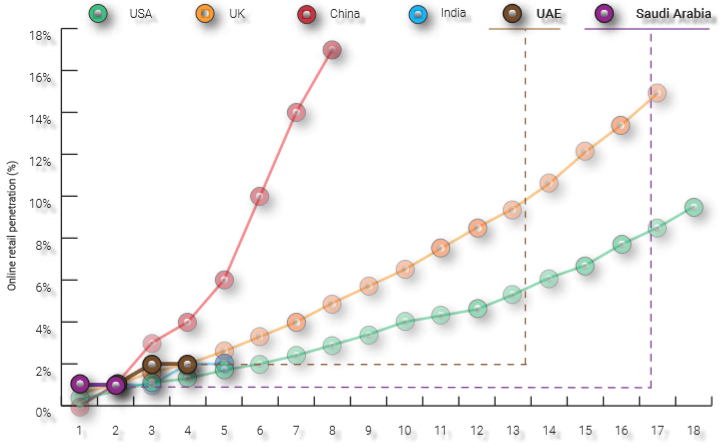 UAE crossed the 1% penetration mark in 2013 and Saudi Arabia did the same in 2015 (figure 1). However, both markets are yet to witness inflexion point (figure 2). 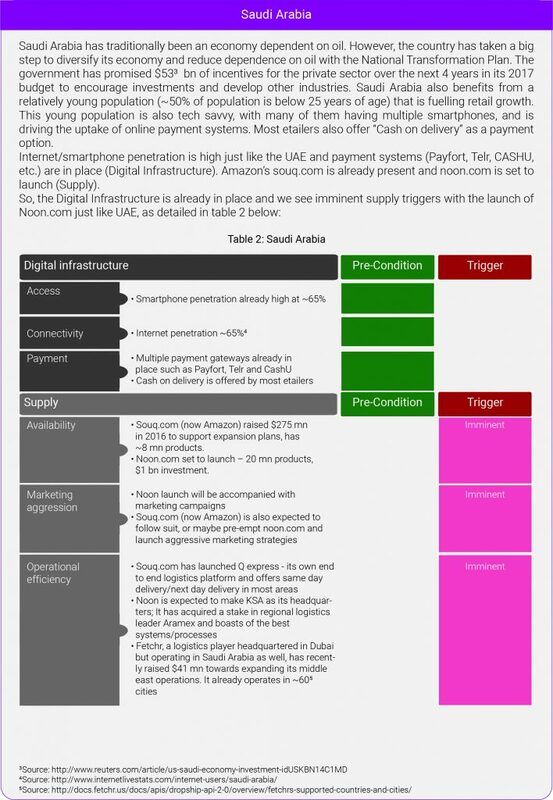 If we compare UAE and Saudi Arabia alongside the other tipping points observed for countries studied in wave 2 in our previous note (as shown in table 3 below), we notice that all preconditions for Digital Infrastructure are in place and supply triggers are imminent. In summary, Digital Infrastructure is already in place in both countries – UAE and KSA. In line with what we have observed with other markets, we see an imminent upsurge – a “tipping point”, driven by supply-side triggers, as early as 2018 for both these markets.